Holt was for many years a chapelry of the parish of Gresford, which was (and is) in the diocese of St. Asaph. 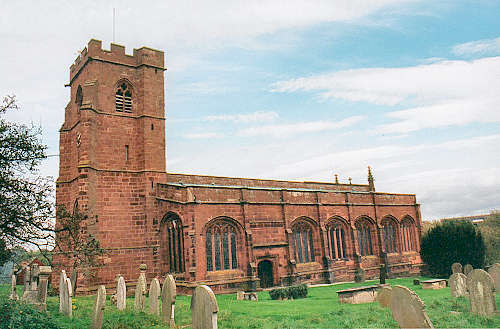 However, Holt was in the diocese of Chester until 1849, when it was transferred to St. Asaph. Holt formerly contained the townships of Caca Dutton, Dutton Diffaeth, Dutton y Brain, Hewlington, Holt, Ridley and Sutton; but in 1829, Caca Dutton, Dutton Diffaeth, Dutton y Brain, Ridley and Sutton went to the new parish of Isycoed. There is evidence that there has been a church on the present site since 1395; and that it was originally dedicated to St. Leonard. The present dedication is to St. Chad. The church was restored between 1871 and 1873. For family history information about the church and parish, visit the GenUKI Holt page.